Dice, Doubloons and Random Musings: Paint Table Saturday: Dinovember Edition! 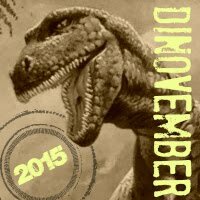 Paint Table Saturday: Dinovember Edition! 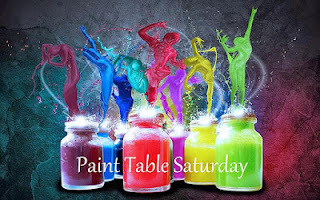 Getting this Paint Table Saturday entry in under the wire...I'm sure most of the people who read this blog won't see it until Sunday morning. I'm also pleased to be able to share my contribution to the Celebrated Mr. Awdry's Dinovember: Reaper Miniatures' Carnotaurus, an anniversary presently from my lovely Gina. I'd decided to paint up this terrible lizard with a beige and turquoise color scheme, and Gina watched with interest as I built up the beige in layers of drybrushing, starting with a burnt sienna and gradually lightening both my tones and my touch to leave the darker browns in the recesses and bring the tops of the scales up to a near-ivory. She then gasped in horror as I began to apply the turquoise, believing that the color was too loud and fearing that I would "ruin" the figure with a garish, heavy-handed paint job. She felt a little better after seeing me apply a dark blue wash to bring the texture out in the turqoise areas, and I finished off the turqoise with a light blue drybrush this afternoon while she was napping. I then applied a tangerine orange to the bone structure around the eyes and the undersides of the horns, based on speculation that the horns would be used to display for a mate. "Make sure you get my good side - or you'll get on my bad side!" The base is done in Army Painter-brand basing material, which I'd never used before but quite like, and some dried lichen from my local arts and crafts supply store served admirably as undergrowth - grass having not yet appeared on Earth at the time when Carnotaurus was stomping around South America. From there, a touch of citron green for the eyes and my Carnotaurus was ready to proudly stride forward, displaying his colors for any interested females while bellowing a challenge to any wayward males in the area at the same time. A coat of Krylon spray matte varnish sealed him in, and I honestly believe the spray alters the saturation of the colors underneath; he looks different, and I'm not sure I have the words to describe just how. Gina saw him after he came in from his varnishing, and gasped in delight - she LOVED how he came out in the end! All that's left now is I want to apply a little bit of lettering to the base - identifying this not as Carnotaurus sastrei, but as "Anniversaurus regina, 2015." That Sir, is a thing of beauty! What a great result, the colours look wonderful, truly inspired. Thank you kindly Michael! It was a treat to work on and paint too. I definitely recommend this figure for you for next year's Dinovember. Beautifully done Bill! Loving the turquoise!! Thank you Ray! Even I'm a bit surprised by how vibrant and "wow!" it came out! Hi Bill. Found your blog from the analogue hobbies painting challenge and am very glad I did. Great Dino! A brave and exciting use of colour and it looks great.